Complicated feelings seem to be the theme for this season of The 100, both for the characters and the audience. The first half of the finale managed to explore both the calm and the story, without even really diving into the chaos that will surely begin in the second half. "Damocles – Part One" written by Justine Juel Gillmer, was an episode that took on plenty with the way that it tackled heightening situations and still explored a bit of the characters within those scenes. Although there was a clear accumulation to a scene that caused concern for many reasons, the episode itself was a setup for something more. Kane and Gaia are now in situations of literal life or death situations, with their loved ones trying to figure out how to keep them alive. This is all being written against the backdrop of a literal war, with making it out alive becoming more worrisome than anything. The threat of humanity once again turns around and leaves everyone on the bloody battleground. Yet in a way, war is the real enemy of this season, and it is what puts everyone in a position that they may have never ended up in otherwise. During The 100 Season 5 Episode 12, Bellamy and Octavia were survivors of the initial face off with McCreary and his guns, leaving them in the worst position yet. Octavia ended up willing to sacrifice herself, which wasn't exactly necessary with Madi arriving in her rover. Meanwhile, Vinson came back for one last meal, and Kane just was too delicious to quit. The question at the core of this episode though, and in the way of this season as well, is the idea of acceptable loss. When discussing plotlines and characters that have been sacrificed for the great good of the plot, one must wonder how much loss is in fact acceptable? Considering Abby's addiction, Clarke's journey to motherhood, the way that Clarke's memory pushed the space group forward, or even the swift shift that Octavia took on and got lost in, is all of this part of the deal? And moving forward with only one episode left, these losses are weighing on the season more and more. Coming from the beginning of a season that played so well with Clarke's newfound home in her feelings and her soft connection with Madi is almost a slap in the face when we consider where everything is now. Starting from the initial issue, Clarke Griffin has been sacrificed. There is no other way around voicing this because gone is the character that was crafted this season as our presence within the show. Now Clarke has become a definition of a mother that involves hurting your child at every turn, especially by choosing to keep the flame in her and then electrocuting her so she wouldn't leave. While Clarke's reasoning may have made sense in her mind, her decisions are in no way excusable. Mothers are practical, and they think about what choices they make, so their child is okay, and lately, Clarke has been written in the strangest extreme. I have to do this, and you have to let me. Permalink: I have to do this, and you have to let me. Wanting to keep Madi safe is an impulse that is not only understandable, but it is also perfectly relatable to many. But the way that she has been going around it meant leaving with Madi when she made her own choice to take the flame, which she was fine with because people she cared about were willing to harm Madi in her mind. And yet, Clarke kept that flame in her head which is a superficial decision if every episode after that is followed by her wanting to remove it. She never does, and Madi goes through painful nightmares and personality changes that almost don't make her who she once was. Then Clarke continues on this journey to protect Madi by hurting her physically, and that is a choice that shouldn't have happened. Abby giving Clarke advice about doing whatever it takes isn't a way to go about introducing such a heartbreaking but also very wrong. Clarke had options, and they included not harming a child the way she did, because that is never who she was and it isn't believable that now having a daughter pushed her in that direction. 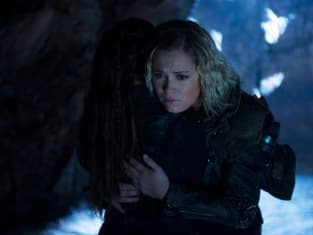 If anything, earlier episodes proved the distance that Clarke had with the idea of harming for the greater good, because at the end of the day that was nothing short of a simple attempt at a shocking twist. Except it landed horribly because it reflects Clarke in an even darker light, one that she has gotten used to this season but in which she should never have been cast. It isn't okay to sacrifice so much of your lead character for the sake of those around her and it is even worse to use her like this for the sake of the plot. Shaping Clarke around the flame arc is a decision that continues to haunt the show. It hurts their main character at a point where she can't be written in this morally grey area anymore because at some point no good guys become just an unrelatable person. And having your audience unable to relate to the lead that was once understood so well is a huge warning sign of what is to come. And that brings us to that scene. That scene was one of the worst for me, it just was. The issue at hand was the way that two big gaps in the season morphed in one sequence and that Clarke had to be at her lowest point to sell them both. Now sticking to the Madi and Clarke arc a little bit longer, everything about the way that Lexa speaks through Madi is an issue. Earlier on there were concerns about how much is shared with Madi through those memories, and having it just be Commander related choices is a way to work around implanting Clarke's ex-girlfriend into her daughter's head. But what happens when her daughter is now reciting lines and reflecting on romantically coded moments within Clarke and Lexa's relationship? Clarke's time with Lexa was meaningful and important, so it is odd the way it is now being harnessed through her daughter as if it isn't a problem within itself. Not to mention the strange way that Lexa is still being brought up even though as a person she isn't returning. Lexa through Madi isn't a reasonable resurrection for the character, in fact, it almost takes away from Lexa as her own person and Madi as a character that had so much agency before all this. Continuing to use Madi as a voice for a character that will never actually be brought back is staggering for the character and it wastes time throughout The 100 Season 5 that could be used for character development from the gigantic six-year time jump. Because reflecting continuously about a plot from two seasons ago in a way to remind the audience that it isn't forgotten is ultimately stringing along a problematic vessel for it. It also removed all the time that was needed to rediscover characters with whom we lost so much time in the first place. These are turning into people we don't recognize and refusing to let them shape the story is a risk that also is backfiring all around. 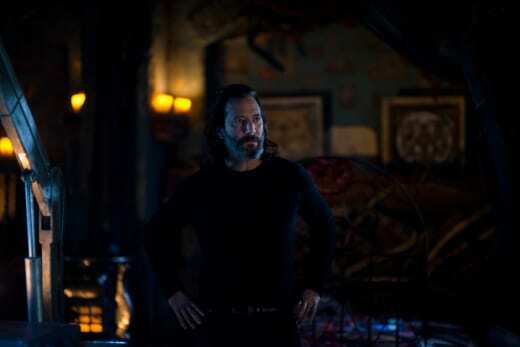 Which leads to the awaited Clarke and Echo scene, one that probably had potential but brings about some worries. To get to this point where they had a faceoff; showing and not telling was a theme that circled back around. More specifically though, it is slightly troubling that Echo had to be put in the position of looking down at Clarke, thus again sacrificing the lead to make the moment fit. There was an essence of the two coming together to talk about the one thing they had in common -- Bellamy. But along the way, Echo continued not to have much else about her defined her until the eleventh hour when suddenly she was meant to come out the hero to Clarke's second-half villain role. Clarke was the person at fault, and she had to be reduced to someone who wouldn't flinch at the sound of those she cares about dying. She became someone who compartmentalized the fact that she left her best friend to die. She spent six years talking to and waiting for Bellamy, and in the span of a few episodes, it was hard to recognize Clarke with Bellamy anymore. That all led to a scene that allowed Echo the upper hand, a scene that relied too much on deconstructing Clarke to distract from the fact that Echo still isn't any different to the audience. Her redemption wasn't explored or given enough attention; it was only sold through other characters discussing it. Yet suddenly Echo is meant to be the voice of reason while Clarke burns everything around her. It removes all value from a partnership that Bellamy and Clarke spent five years building on screen for the sake of selling something that happened offscreen and continues to have no actual value within the show. Instead, Clarke took the fall as an unrecognizable presence amongst the people for whom she risked her life and those who were inspired by her memory. And through that, she, much like Bellamy, got the job of solidifying a relationship with no content and no work being put into them. This weird unawareness of the way that Bellamy and Clarke's relationship was diminished for the sake of another is a problem. The Echo and Clarke scene magnifies how far down Clarke has been pushed and how hard it will be to bring her back up. It is a heartbreaking contrast considering The 100 Season 4 ended with Clarke selflessly staying behind to live six years completely alone for her people. Now she is shoved to a point where her friends don't recognize her because she is protecting Madi, who she suddenly electrocutes. Clarke Griffin was the biggest acceptable loss of the season, who at the core was becoming nothing more than a distracting memory to push along plots until the finale when the last shocking twist of the season emerges. Octavia spent a decent amount of time this season in the well-suited role of villain. She had unexpectedly gone to the dark side, and even in current time, she was a completely different person. The 100 Season 5 Episode 10 opened that door for the question of redemption, only to shut and lock it when Octavia burned everything to the ground for the sake of war. Octavia realizing that Wonkru is broken could have felt earned with the right amount of progression and structure. Instead, Octavia's self-sacrifice fell victim to a finale that requires all the characters sacrifice their outside arcs for the sake of the last episode of the season. On top of that, Octavia's decision to sacrifice herself just doesn't play as well when the stakes aren't there. Octavia was never going to be in any real danger, and while she believed that she was when she ran into that battlefield, the audience didn't, and that is also a problem. A redemption arc like Octavia's requires tactical precision because it would be a long time coming, since The 100 Season 3 in fact. Octavia was on a downward spiral and to get her to a point where it is believable that she is no longer going to fill the dark role that she took on incredibly well this season, it has to feel earned. Just at the beginning of "Damocles - Part One," Octavia was still laying all the blame on Bellamy. She was no closer to figuring out that the role she played was the real issue in all this, and she was still pointing the finger at her brother who spent a whole season trying to prevent everything she was willing to risk. Permalink: My brother, my responsibility. War was never the right answer and then when Octavia stirred the pot to the point when there were no real other choices, then the blame still somehow had to lay with Bellamy for not stopping her own destruction. Luckily, Bellamy held his own like he should have for years already. But Octavia then miraculously found it within herself to flip the switch that everyone else was begging her to for the entire season. Suddenly it all accumulated in Octavia feeling like this was the rock bottom that would spur her to act in a way that didn't self-serve her anymore. And while that transformed into an epic sequence, this was the trigger that the show chose not to pull. Because of that, this entire shake-up for Octavia fell flat in the grand scheme of things. A redemption isn't that easy and it isn't this swift. If Octavia really is going to survive and possibly inch towards being a better person, there has to be more thought and specifically timing dedicated to exploring that. It isn't that Octavia can't reflect and transform into a version of a person even she herself can respect more. The real issue is the way that it happened in the blink of an eye. Because witnessing Octavia making a choice to risk her life for her people is a turn from everything we saw leading up to that. She recognizes of what she stripped others, and she is using that to maybe fix some damage that was done. But perhaps this is what war brings it, it removes all sense of timing and it turns everything up a notch. Octavia had to go to war to realize just how wrong she was, and it was only then that she could come to terms with just that. Yet was it worth all the lives that were lost on the way to this war? Is everything that was sacrificed for Octavia to get her redemption in the heat of the moment just an acceptable loss? Or perhaps the timing is the real acceptable loss we made along the way. Abby's addiction is now in the rearview mirror, but was this the right choice? This entire season was leading up to Abby's breaking point, but the journey there took a few sharp turns in the way that her own story was told. Abby's dependency on the pills was only really even explored in The 100 Season 5 Episode 11, and now suddenly it is a one and done situation where the addiction exists but it has been forgotten at the same time. The issue was always how her addiction was explored, with the main concern being the fact that this was all about how Abby's dependency on pills affected everyone around her. She was the only one who we didn't gain enough perspective from, and when that finally was referenced it was because this was all coming to an end. There is some frustration in the way that Abby's notable journey was sacrificed in the beginning for other characters and now is being wrapped up entirely in anticipation of Kane's condition and the final episode of the season. It is possible that Abby's addiction will be touched up further, but it is also probably safe to say that this was the end of this storyline. And while obviously Abby handling all this needs to see the end of the tunnel, was the story itself told well enough? Because at times it feels like it was meant to be explored but then by the time it felt like it was being dug into, suddenly it ceased to matter. It is another risk that should be considered in a season that is swallowed whole by all the arcs that were meant to be explored. Abby's journey was a personal one, something that almost every other character on the show didn't get to have. So if Abby is allowed this time to not worry about war but to focus on something within herself, shouldn't she have that? She was still meant to just be there in that med bay working to save the characters that will burn everything to the ground, and now that it is finally done so is she. There is so much more there, even in that simple line when Clarke asks Abby whether she overdosed on purpose or by accident. There is substance but the execution left more to be desired, with Abby's side of the story being an acceptable loss that came late enough in the game that is stood out more than anything else. But now Kane is in trouble and that is Abby's biggest concern, especially since they need to head to battle and he is in a horrible condition. Raven: You're worried you will break? Shaw: Yes, I will. When they torture you. Permalink: Yes, I will. When they torture you. There is also the fact that they just don't have anything to help him on that field, which is the real enemy to worry about here. Injuries could happen before because healing somehow happened through minimal supplies. Now there is nothing so these characters that are near death, they really have nothing to count on but themselves and their bodies pushing them through this hurdle. Kane getting bitten isn't great, in fact, it is a real injury to look out for. But what a way to come full circle, with Kane not wanting to eat human meat and then suddenly he became it. How do we even begin here? The fascinating thing in all this is the way that a scene used Clarke's past to reflect on the regret she feels and the way that she needs to avoid making the mistake Lexa made when she left Clarke. 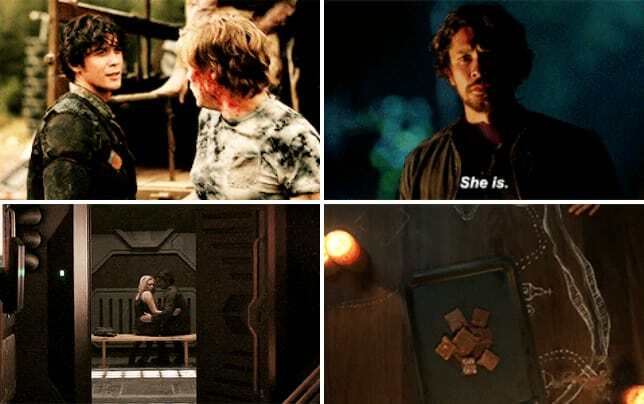 This is a parallel that stretches to Clarke now being in a position where someone she loves in in danger and she needs to make sure he is alive. Could leaving Bellamy in the bunker mirror Lexa leaving Clarke in Mount Weather? The circumstances could not be more different but at its core, Clarke made a mistake and Madi is using the information she knows to make sure Clarke doesn't let the person she loves die in battle. Furthermore, Madi is emphasizing the deepest regret that comes with it, because Bellamy's life is something that Clarke can't have on her hands. This person that is considered Clarke right now may not show it, but those glimpses of emotion are Clarke at her most vulnerable. That is my Clarke and that is what most of us have been waiting to see appear ever since The 100 Season 5 Episode 9. She is in there somewhere and at her core, her worry for Bellamy is what continues to shatter at that hollow shell around her heart. Clarke is guarding herself more than usual, but it can't be a coincidence that Madi keeps bringing up Bellamy, He is her soft spot and Echo didn't miss that either. To make Clarke realize the position that she is in and the mistakes that she made, this scene became everyone in that room depending on Bellamy's memory. Similiar to Bellamy gaining strength from the memory of Clarke, she is now gaining perspective and becoming her own person again with the chance that there might still be a way for her to keep Bellamy alive. To make up for what she did, Clarke was poked at by Echo, Madi, and Lexa's memory in the heart. And the way to access her heart is to mention Bellamy. This doesn't take away from that constant back and forth that Clarke went through that didn't amount to anything by the end of the episode when she just gave in. As much as Bellamy and Clarke became probably the biggest acceptable loss of this season, there is no question of the legacy that they hold. Their awareness of one another and their connection is one that even six years later is a weakness. It is the biggest loss and more importantly, it is the one most felt. Clarke and Bellamy not being on the same page ripples throughout the season, affecting the positions they are in and the decisions they make. While stripping them of leadership is an effective way to put them in a situation unlike anything they ever really went through, the mistake was then not keeping their relationship as the constant. Permalink: Bellamy's not dead, Clarke. The season suffered most from that, and Clarke especially is stuck in a position that can't easily be dug out of. And yet, the memory of what they mean to each other still rings true. Bellamy was willing to lay that all on the line for the sake of Clarke staying alive and now Clarke needs to step up and realize exactly how far she has fallen. Clarke needed to hear from that entire room how wrong she is when considering the decisions that Bellamy made, and this was all meant to shape how she makes decisions herself going forward. Even at their darkest moments, what they meant to each other is the saving grace in the last second of the battle. Talking about Bellamy pushed Clarke to finally make the decision it took episodes to make happen. And while their relationship was a painful sacrifice that made the entire season suffer, the effect that they have is still clear as day. Bellamy being the one to guide Gaia to survival even for a little bit longer is all I will talk about for weeks. After Bellamy and Indra became best friends following that bonding moment in the fighting pits, it was only a matter of time before Bellamy and Gaia demanded to be explored. 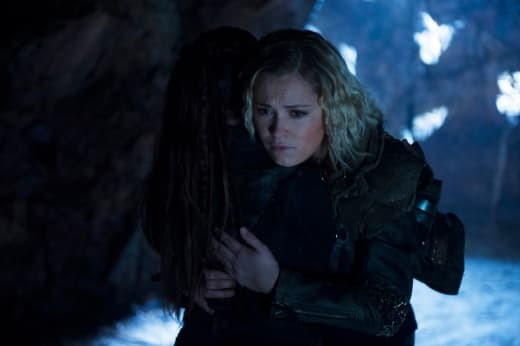 There is just so much potential there for a nice friendship and a show like The 100 only benefits from more honest and pure connections. Considering how much the second half of the finale will cover, there is still that consistent feeling like Season 5 was just dragging around until the end when it would implode and real answers would only come during Season 6. Lexa clearly meant a lot to Clarke and continues to mean a lot to the show. But the fact that six years later Clarke still isn't given the chance to just be is defining. The issue with the flame is that it can't be explored without overpowering everything else for whatever reason. And now it again forces this idea that mourning is this constant weight that Clarke needs to uphold. It is perpetuating the fact that Clarke can't just live with the memory of her time with Lexa, she has to be swallowed whole by that pain until the end of time. It isn't healthy to sell that and it again doesn't do much to add to Clarke and Lexa's relationship. It is like picking at an old wound without doing much to heal it. Bringing back Vinson one last time like that was pretty epic. He needed that one last meal. Pilot Mechanic is the savior this season clearly needed. Not only is Not-Zeke a guy who is in awe of everything that Raven is and not only is he someone that makes her smile endlessly, he is also the guy whose weakness is now Raven's safety. These two prove how a relationship can work in the face of plot arcs and minimal scenes. Raven and Not-Zeke have the substance that some relationships dream of. They have come so far and it is felt in every aspect of who they are when they are together. Not-Zeke consistently shows how much Raven is worth to him and Raven in return shows how important he is to her. The fact that Wonkru is out of all medical supplies is definitely nothing. There are no worries there and everything will be flowers and sunshine. Except that it won't! Indra and Gaia's relationship is the true mother and daughter standout of this season. It is almost unfortunate that they weren't sold as such prior to, and yet it is like the best surprise. Here are these big sells about a mother only focusing on her child and how important that will be, and then here is a firm example of it. Indra and Gaia's scenes don't need too many words, they have the ability to form that all on their own. There is something truly beautiful about the sacrifices that Indra makes for Gaia, all while Octavia's worth to her isn't taken back. Indra caring about Octavia doesn't need to be removed from the narrative to signify just how much Indra loves her daughter. It radiates through every choice that she makes and it hurts every single time those sacrifices have to be considered. RIP Ethan. That one second shot of you was meaningful, and you will be remembered by someone, somewhere. I am ready for Shannon Kook's character to blast out of the sky and save this season. At this point, he is the only hope I have right about now, and he won't let me down. Hero or villain or morally gray guy, I am willing to sell my soul for him. What did you think of the episode? What is your opinion on Clarke's place in the narrative right about now? Is there hope in the finale to pick up all the dropped pieces? What did you think of Octavia's swift redemption? Should she have died as she was willing to? What did you think of Abby kicking that addiction so quickly after the story was finally hers? What did you think of that scene between Clarke and Echo and Madi? How much more of Gaia and Bellamy's unlikely battle crafted friendship do you want to see? More importantly, will Kane and Gaia survive? Who are you worried about most? What do you see happening in the second half of the finale and how long have you been waiting for Lucas to finally appear? Which part did you love the most? Which part did you like the least? How hard are you still shipping Pilot Mechanic? And don't forget that you can watch The 100 online, right here on TV Fanatic.